The Active MLS listings of Homes for Sale in the Creekside community are shown below. For more information or a showing, call Jim at 512.913.1557. NOTE: Because this is a new home community, all of the listings may not map properly. Location: From Austin take IH-35 south to the FM-150 exit (#213). Turn left across the freeway, then follow FM-150. The entrance to the Creekside (and Brookside) is on the left just past Four Seasons Farm. Turn left at Arbor Knot DR and go to the new construction area at the rear. This table gives an overview of real estate activity in Creekside Kyle over the last 3 years. CREEKSIDE KYLE real estate market data from the Austin Board of Realtors, 1/1/16 - 12/31/18. In 2016, Bigelow Homes began developing a new part of this area behind the Brookside subdivision. It is known as Creekside, but has a legal description identifying it as Brookside Phase II). In December 2018, Bigelow continues to add new homes, including those in a new section on the east side of the neighborhood. Creekside is identified clearly via the sign at its entrance. Bigelow offers 20 single- and 2-story plans with 1-4 bedrooms. Their base prices in December 2018 go from around $180k up to $291k. The standard features in these homes include 9' ceilings (1st floor), ceramic tile in the family room, kitchen and bath areas, continuous mechanical ventilation and fully-sodded yards. Optional features include front and rear porches, or screened porches (see the model home), and more. Also, Bigelow Homes guarantees that the cost to cool one of these Creekside homes will be less than $400 for the first three years of ownership. Creekside homes are built in a manner similar to many of the homes in the nearby Plum Creek Kyle subdivision. Most of the homes have rear-entry garages that are accessed via an alleyway that runs behind them. The exteriors of these homes have varied paint colors, similar to those in the Plum Creek subdivision. Some neighborhood amenities in Creekside are in the works in 12/18. They include a playground, Bocce-ball court and a Pickle-ball court. When completed, Creekside will have 15 private neighborhood, or pocket parks, that will serve 12-20 residences. They will provide opportunites for neighbors to interact with each other either from their front porches or in the pocket parks themselves. The neighborhood is adjacent to the Plum Creek Preserve. This area is home to Lake Kyle, which is operated by the City of Kyle. The lake facilities include those for youngsters (playscape, climbing, etc. ), a Park Headquarters building (located at 700 Lehman Road), public restroom facilities, a fishing pier (permit is required), and walking path. Some of the land is set aside for wildflowers ("no mowing" signs are present). 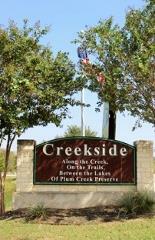 Creekside has a mandatory HOA (Homeowners Association). Fees of $175 per quarter are used for common area maintenance and upkeep. Taxes on homes in the Creekside neighborhood are levied by the City of Kyle, Hays County, the Hays Consolidated ISD and others. TRAVEL: Creekside is just a "hop, skip and a jump" from IH-35, the key artery that runs between Austin and San Antonio. Residents of these neighborhoods have many options nearby for eating, shopping and recreation (in addition to the recreational facilities at Lake Kyle). Air travelers can connect to the Austin Bergstrom International Airport (ABIA) via SH-45 just north of Buda, then to the SH-130 toll road which leads to US-71 and the airport. SHOPPING: Major shopping developments along IH-35 in Kyle include those in the Kyle Marketplace and Kyle Crossing (HEB Plus & Target,) and those in The Village at Kyle (WalMart SuperCenter & Lowe's, e.g.). These developments are located on the east and west sides of IH-35 at the Kyle Parkway. There are also a Home Depot and EVO Entertainment Center at the next exit to the north (Kyle Town Centre). Options in South Austin include the Southpark Meadows development (WalMart, RoomStore, Sam's, Target, and many more) and the Cabela's outdoor store (Buda). You can also visit many other places in San Marcos (Tanger Outlets & Premium Outlets, e.g.) and in San Antonio. GOLF/MEDICAL: Creekside golfers can play at the Plum Creek Golf Course, located in Kyle, and at other courses in the area. Healthcare facilities include the Seton Medical Center Hays (located at The Village of Kyle) and several emergency/walk-in places in the area. Area schools for students living in the Creekside neighborhood are run by the Hays Consolidated Independent School District (HCISD). Parents and prospective homebuyers should confirm the currently-assigned school attendance zones with Hays CISD.